Patrick Mahomes vs Deshaun Watson – These 2 guys are forever linked by being taken 10th and 12th overall in the 2017 draft. Both of these guys, I’m a big fan of, and I think both of them set their respective teams up for big time success for the next decade. Even though they’ll only go against each other for 1 drive tonight, a chance to see both of these young signal callers go head to head is definitely something to strap in and be glued to in the opening quarter. Safety play from the Chiefs – Daniel Sorenson sustained a knee injury this past week in practice, and could miss some pretty significant playing time. With “Dirty Dan” sidelined, it will be left to Rookie Armani Watts and 3rd year man Eric Murray to fill in. Sorenson came to Kansas City as an undrafted free agent, and has stepped his game up every year since joining the team. Watts comes in highly touted, but with questions about his ability to cover and wrap up on tackles. Murray has been average the last couple of seasons, and in year 3 needs to take a big step forward to keep his spot on the team. Seeing how these 2 guys fill in and react is something to watch closely, especially if they end up needing to be relied upon for a heavy workload if Sorenson in fact misses significant time. The Offensive Line – The Chiefs ultimately will only keep about 7 of the 15 guys they have in camp as offensive linemen. However, in the preseason these guys need to show their flexibility and ability to play multiple positions. The biggest spot to watch is at Left Guard, where Cam Erving appears to have taken the starting job, but 3rd year man Parker Ehinger is back from injury and has a shot there as well. Rookie Khalil McKenzie has looked solid in camp and 2nd year former UDFA Andrew Wylie has looked strong as well. Keep an eye on how these guys perform because you can never have enough depth up front. Blake Mack – This guy, is an undrafted rookie who played tight end in college and the Chiefs are trying to transition him to wide receiver. 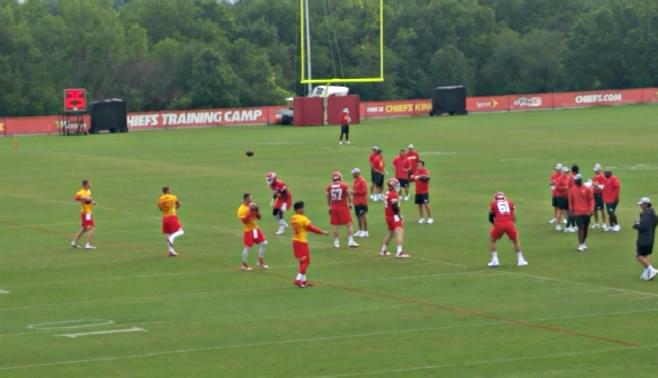 Mack has shown flashes of brilliance in camp, in my opinion, if the Chiefs were to leave him as a TE, he would make the roster with no problem. However, since they’re lining him up at WR (arguably the deepest position on the team) he’s got very little chance to make it. With all that said, he’s a really exciting player who catches everything thrown his way. In the 2nd half of tonight’s game, look for him, he’s wearing #88. Tremon Smith – He’s the Chiefs’ 6th round draft pick from this years class. He’s also extremely fast. Smith has been called the 2nd fastest player on the team, and has been really shining on special teams in camp practices. He’s returning kicks and punts for Kansas City, but he also plays the position of corner. He’ll probably get most of his defensive playing time in the 2nd half of the game, but look for him early on punt and kick returns as the Chiefs will probably be hesitant to use Tyreek Hill in the preseason at those spots. Spot him as he’ll be wearing #39. As always, catch the game tonight on Topeka’s Rock Leader V100. Chiefs radio network pregame begins at 6:00 with kickoff to follow at 7:30. Turn the radio’s on and mute the TV to get the best experience of both worlds and keep up with me on twitter: @m_c_luckie during the game for more Chiefs news.